In document management, Scanning and Capture refers to the process of scanning paper documents to convert them to digital documents, capturing important information in them and saving them in a central repository for easy retrieval later. Docsvault provides tools to simplify the scanning process for large amounts of documents and index them during the process. You can split, merge, rescan and drag and drop pages or set auto document separators using barcode sheets or blank sheets for easy document separation, filing and recognition. Scanned files can be saved in Tiff or PDF formats for permanent storage. OCR add-on allows identifying text content in scanned files for search and retrieval using Docsvault’s search interface. Rubber band OCR helps you fill values in index fields easily during manual indexing process. If your paper documents are scanned and stored in a central repository, you can make your office truly paperless, more organized and save all, your important documents without occupying extra floor space. A good document management software will save you time and money by eliminating unproductive activities like storing and retrieving documents from folders and cabinets. Docsvault makes your paper documents searchable with OCR, so you don’t have to go over every single detail in documents to extract information. All your documents are saved in a safe and secure location, with user and group level rights assigned to important documents, to protect the misuse of sensitive data. 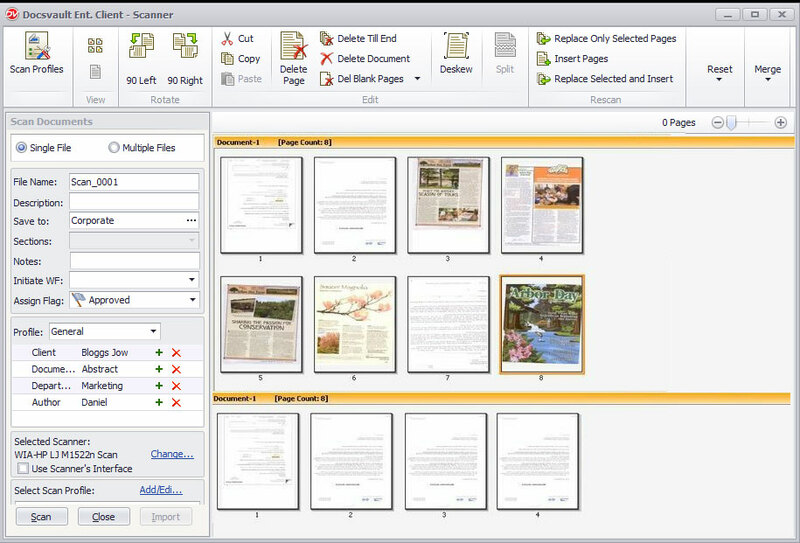 Find your scanned files quickly with OCR add-on and save time. To maintain a paperless office, it must be convenient to search files easily, which is made possible with OCR.